New To Kuddly? Here’s How We’re Helping Pets Everywhere! At Kuddly, we believe pets are family, and we believe that all pets deserve world class care. We’re a team of animal lovers and pet owners, veterinarians and entrepreneurs who saw a need for pet owners everywhere to have access to quality and professional information about everyday (and not so everyday) pet health and care. Rather than relying on online search and questionable information or pay for an office visit to obtain information about pet health and care, you can ask a verified, professional veterinarian directly via Kuddly on your smart phone or tablet. While Kuddly isn’t meant to replace office visits that your pet needs and must have, it is a way that people everywhere can ask questions that may not require a regular office visit. For example, you can ask about different flea treatments and how they work. Or, you can find out some of the causes that might be behind your pet’s excessive shedding. You can ask about different treatment options, or speak with a Kuddly veterinarian to see if an office visit might be necessary for what your pet needs before making an appointment. Kuddly is also a resource for finding qualified, verified veterinarians from around the world. 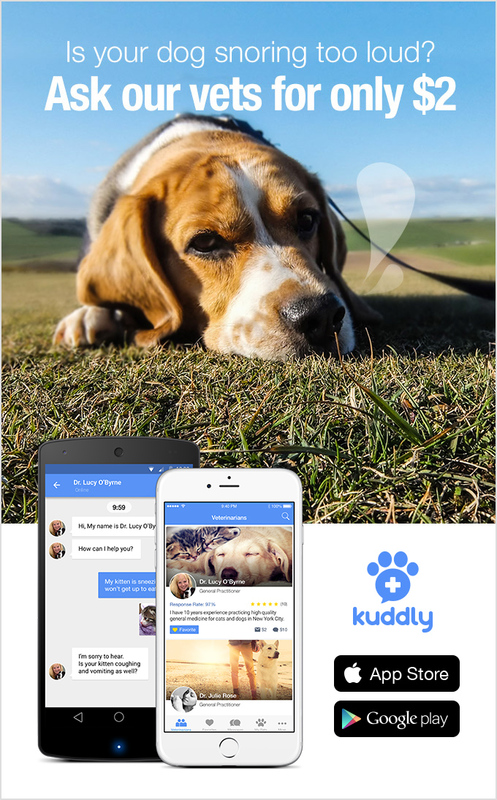 So, if you’re traveling with your pet, moving to a new city, or just want to gain insight beyond the borders of your city/town about your pet’s health and care, Kuddly can help here too. With veterinarians from around the world, Kuddly can be an asset and help no matter where you go. Kuddly’s free to download and asking questions can be as little as $2, making it affordable for everyone. You may also find that your current vet is using Kuddly and can ask questions about care whenever you need it, without an office visit. We’re super excited to share Kuddly with the world, and can’t wait for you to join our community!